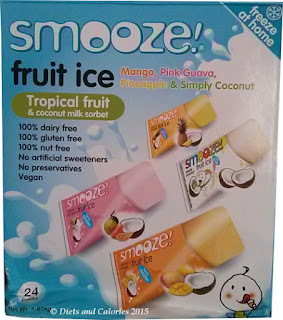 Smooze are a fairly new arrival in the frozen ice lolly section. No sooner had I read about them in a newspaper, when I came across their stand at the Allergy and Free From show at Olympia in London. Capitalising on the coconut milk trend and catering to those who are gluten free or vegan, Smooze ice lollies are probably suitable for most people. There are four varieties, all coconut based: Coconut & Mango – 67 calories; Coconut & Pink Guava – 65 calories; Coconut & Pineapple – 68 calories and Simply Coconut – 112 calories. Actually, it seems that Smooze aren't quite as new as I’d thought. Apparently they were around back in 2012 and were made by Kara – the coconut milk people. This time round they are imported by Think Products Europe Limited and produced in Indonesia. When I first saw these in real life, they reminded me of a frozen snack I used to buy in Australia called Snip. They were triangular shaped cartons containing frozen flavoured milk. You had to ‘snip’ off the corner then slurp away or bite at the contents through the opening. Smooze are a similar idea. 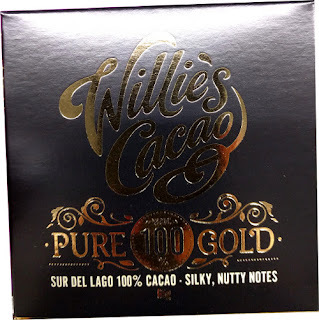 They’re packed in small, palm sized triangular cartons which you have to cut or tear open along the dotted line at the top. You then gently squeeze up the frozen contents (your hand helps to melt it, making it easier to slide up). 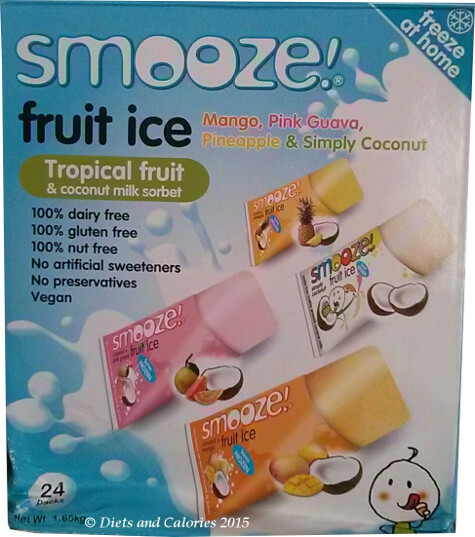 Smooze a bit different to other ice lollies on the market as you buy them unfrozen. If you’re short of freezer space, you can store them in a cupboard and just pop them in the freezer as and when you want them. 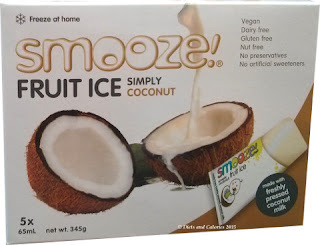 ‘Smooze is a low calorie, freeze-at-home, tropical treat that is perfect for the whole family. Made simply from freshly-pressed coconut milk, with one taste, you'll know you're eating something good. Free from dairy, gluten, soy, nuts, artificial sweeteners, colourings and flavourings, Smooze is a portion-controlled, guilt-free indulgence guaranteed to delight; you'll fall in love with Smooze. 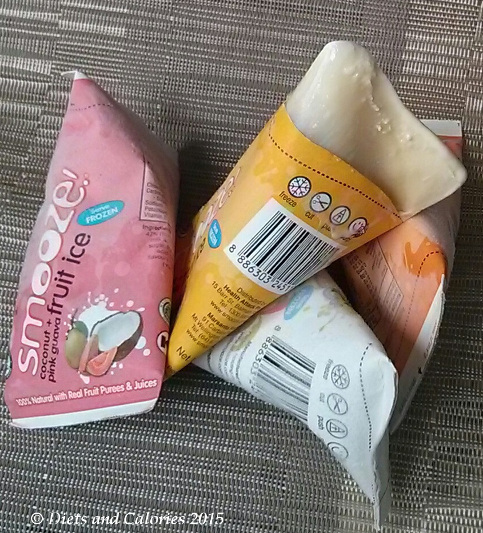 Smooze is sold in boxes of 5 with a single flavour in each pack. However, at the show I purchased a variety multipack of 24 as this worked out cheaper. It also gave me a chance to sample all the different flavours without forking out for a box of each. I found I definitely needed to use scissors to cut the tops off and needed to use the warmth of my hand to finally release it from the packet. Running under hot water does the same thing. Onto the taste. Very nice. I liked them all although the Guava was a bit unusual. I love coconut so that was my favourite. It was exactly like frozen coconut milk. Parts of them were icy while other parts were creamy. I remember this from when I used to buy Snips in Australia. We never knew whether we’d get a creamy one or an icy one. I think it really depends on how the contents have settled once you pop them into the freezer. Although they’re only small, they don’t take any less time to eat than larger ice lollies. And a good thing about eating them straight out of the container, is whatever melts just stays in the pack and doesn’t end up dripping everywhere. This is always a boon when it comes to children and ice lollies! I might have said these were a healthy ‘kid’s choice’. There is one snag though. They’re all high in sugar! Every one of them has added sugar amounting to around 2.5 teaspoons of sugar per lolly. Definitely not the way to go these days. Buy reduced fat coconut milk (if you want to lower the calories). Buy a pot/tub of organic fruit puree. Mix together and freeze! Alternatively, blend a mango or pineapple or strawberry etc., and mix with the coconut milk. Available from Ocado Online, Sainsbury’s, Holland & Barrett, Whole Foods Market, Amazon, as nature intended and Costco Wholesale. Prices vary depending on offers and where you buy. 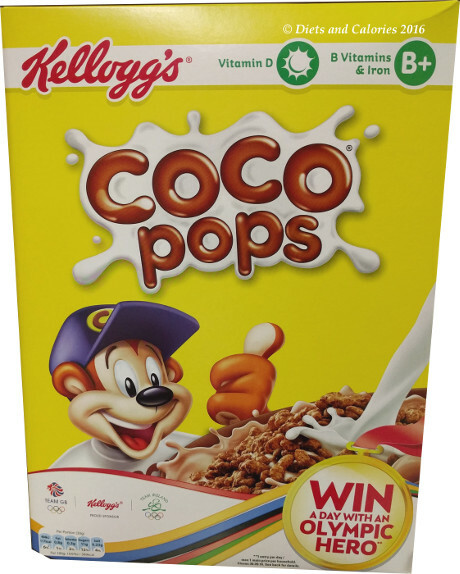 Nutrition information per 65ml lolly: Coconut & Mango: 67 calories, 2.0g fat, 1.9g saturates, 11.9g carbohydrates, 10.5g sugars, 0.3g protein, 0.01g salt. Ingredients: Mango juice (48% (from puree), coconut milk 40% (coconut cream, water), natural cane sugar, gelling agent (fruit pectin), acidity regulator (citric acid), natural fruit flavourings, antioxidant (ascorbic acid). Nutrition information per 65ml lolly: Coconut & Pineapple: 68 calories, 2.1g fat, 1.9g saturates, 11.9g carbohydrates, 10.7g sugars, 0.3g protein, 0.01g salt. Nutrition information per 65ml lolly: Coconut & Pink Guava: 65 calories, 2.1g fat, 2.0g saturates, 11.3g carbohydrates, 10.4g sugars, 0.3g protein, 0.01g salt. 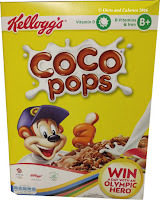 Nutrition information per 65ml lolly: Simply Coconut: 112 calories, 5.9g fat, 5.6g saturates, 14.4g carbohydrates, 10.6g sugars, 0.6g protein, 0.07g salt.